I’m dubbing the impending turn as “The Turn of the Century.” It’s not the top of the market, but there are turns happening at the same time in the US Dollar (and related currencies), the US indices, and gold and silver. It looks to me like they’re ALL going to change direction during the coming week (perhaps earlier rather than later). For over two years now, I’ve been saying that we’re going to see all major asset classes gradually align in their movements to end up at a top all at the same time. That’s what you’re seeing. I refer to it as “All the Same Market,” a term that was coined by Robert Prechter quite a few years ago. It’s one of the reasons this market has been so difficult to trade: Every asset class depends on the movements of all the others. In other words, the US Dollar (being the reserve currency) is in control, as everything pretty much relates to it in today’s financial world, and all asset classes have been slowly moving into alignment with its movement. At the same time, all assets have to conform to Elliott wave rules in terms of how they move, which they’ve done, but it has meant some long periods of waiting (eg- USD currency pairs) as other asset classes move at a faster rate. It’s made for some very odd movements and, as a result, a very difficult market to trade. That’s about to change as we trace out the remaining waves to the ultimate top. There are almost always non-confirmations at the top of a market. In other words, patterns in the various US indices don’t match, or different asset classes make major turns at different times. I would expect nothing less at the top of a 500 year bull market. However, in the past few weeks, I haven’t paid a lot of attention to it, because until patterns are fully developed, there isn’t much need: It ends up being fairly speculative. For example, both the SP500 and NYSE morphed out of perfectly good contracting triangles into something that looks like an ending diagonal … BUT. The “but” is there because there are problems with calling some of these patterns ending diagonals. They either don’t look quite right or measure improperly. However, some of the patterns have changed over time. However, we’re at the end of this B wave up in the US indices and virtually everything is aligned for a turn. Now that we’re in the final 5th of 5th wave up in the so-called “third wave” of these patterns, it’s time to focus in more specifically on what we have here, because the length of the next move to the downside will be a result of the pattern we’re in. If this pattern is an ending diagonal, with the top of the third wave being the current high (13,039), the fifth wave of an ending diagonal must not be longer than this third). However, doing the measurements, a projected wave five (measured from the highest level of the fourth wave trendline) cannot possibly reach a new high. Therefore, the ending diagonal option is off the table. The C wave could go lower, but that’s less likely. Because we have an A wave that is in three waves, the first option is preferable, imho. This will result in an overall ABC pattern, which requires a new high. Bottom line: I expect a C wave down before another wave up to a slight new high to end the 500 year rally. And in my opinion, this prognosis also affects the SP500 (and ES), which have patterns that look like ending diagonals, but for a number of reasons, these patterns are already on shaky ground. As my Trader’s Gold subscribers know, my prognosis for the SP500 and futures have changed slightly. I don’t think we have an ending diagonal in ES. I’ve provided my preferences under the ES chart below. The overall view of the market has not changed. The only thing that has is my projection to the downside for the next wave, which will likely turn down early this week. Although I'm still showing the ending diagonal trendlines, my preference is for this pattern being a regular flat. This is due partly to the look of the current "third" or "B" wave up that we're currently at the top of. It hasn't quite topped (look for one more wave up at the beginning of the week) but once it does, it should drop to a new low to at least the 2537 area and probably lower. We're still waiting for this complex B wave to top. Last weekend, I predicted one more wave up to a final high and that still seems to be the case (after a couple of wave failures). The waves down are corrective. I do not expect a new all time high before we turn down in the expected C wave, as that would change the count and pattern completely. Summary: We're waiting for a top in a B wave, which will result in a C wave to a new low. 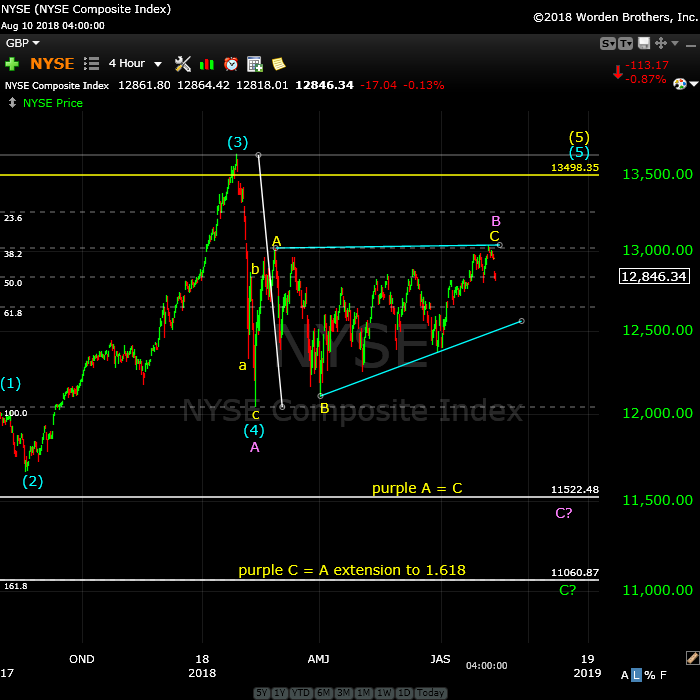 Once the c wave (down) is complete, expect a final fifth wave to a new high. That fifth wave up to a new high will be the end of the 500 year bull market. Thank you Sir PETER for your continued brilliance. Few analysts are as precise and matter of fact as you are. Muchos GRACIAS! One quick question on ES. There may be a head fake or two before the real move in my earnest opinion. What level will ES need to drop to for confirmation of the 4th wave? haha … you’re welcome. At this point, I’m calling for a C wave of the fourth wave (rather than a fourth of an ED), but it’s always the previous small fourth of one lesser degree that provides that clue, and that’s still around 2790. One thing I’d add to your excellent update . C % decline = A % decline . Well, Joe, my subscribers get that information but I can’t share everything they get. As far as interests rates go, they’re not going up; they’re turning down, despite what the Fed says. Joe, in this circumstance, would that be around 7.5%? 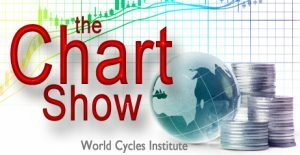 Elliott wave theory is about probabilities ? Time period which tends to flip the market all over the place . My bias for the ” mini crash” stands but ….There is no 100% guarentees ever ! Even with my bearish bias. The us dollar will eventually ( sooner or later ) effect corporate profits . Strong dollar caused a similar effect . As those who try to hedge currency risk panic and buy the US dollar. Governments also will have problems trying to finance their debts . There are so many things to consider going forward that my head spins . SPX was a mere 16 points from a new ATH. If the current move down is indeed corrective, it is hard for me to see how we avoid a new ATH with any new wave up to complete a B wave. I guess that would change the pattern to an expanded flat. Listen to your interview with Steve puetz. I mentioned left translations vs right translations . To hear a follow through interview in the future if it’s possible . Lastly : I view cycles from low to low but not sure if puetz does . Turning down leaves me to wonder where that cycle low would be . Do I look out half that distance ? 1.75 and 3.18 years or ? Early 2016 to mid 2017 cycle low which was a very good cycle turn call ! The next ideal cycle high . Late 2019 to 2023 points to a cycle low . I agree in general yet I’ll have to refine this because I’m seeing something a bit differently . I was completely wrong about the dollar. It broke to the upside from what looked like some kind of triangle. Some analysts see an IHS pattern which if correct, means the index is headed to 100. This has big imiplications for equities. “Is there room for the equity bull market to continue? Thank you Peter T for all you do. Wisdom is an incredible gift and you use yours to help others. It is noticed. Thanks, Jeff, you’re being too kind. While trying to help people is the underlying motive, I’ve learned that herding is an extremely powerful force … sigh. And that is why I’ve shown up online. I’m trying to contribute what little I know … always learning. Thanks Peter and everyone else for your inputs. Its very helpful. I do see some chance that we get a head-fake move to form a double top on ES (maybe by 8/16 or 8/17 to around 2875-2878 area), but I cannot assign a high probability to that outcome. From a probability standpoint, I would much rather be short right now than be long to play for that last potential move higher. I do agree that we need to break below 2790 to have confidence in the short trade. Peter, thanks for the update over and over again. Aug 7 was the top, for now i have a low Aug 14/15, after that we will rebound till Aug 21 should be a lower high with a mini crash into the full moon or end off the month. August 8 was Phi turn date so the August 7 top was right on the money. The next Phi turn is due October 2nd. Yep. Nothing I see about this move down suggests we have a low in place. Willem’s assertion a bit of a mystery to me…. From what I can tell, we have one more wave down in a fifth wave to complete a possible C wave, OR a small one of a larger C. VIX already tagging upper B band so hard to tell how much more downside. It will be interesting to see how the lunar cycle plays out this month as we are two weeks away from the full moon anticipated low. Interesting times! Puetz’s work is not that useful in timing bottoms, as he himself admits. Essentially these cycles play out in an idealised fashion when emotions are running high – that is, when speculation and borrowing are rampant, and these tend to disappear at the bottom. Puetz work is based on harmonics of 3; each cycle is 1/3 or 3 times greater in length than its neighbouring cycle. Verne, interesting how you reference a VIX tag of upper B Band today as a possible limit to downside market potential. Normally, that would be true, and it might be again, but for a couple of days now I have been noting an analogy, so far, between market action after Jan 26 high and after August 7 high. The Jan high saw three days trading at the high while this August 7 saw only 2. But the gap down is where the analog begins. They were both very similar in terms of magnitude on SPX. Friday, Aug 10 gap corresponds to Tuesday, Jan 30 gap. In both cases, the following day (today in the analog) saw a very slightly higher high than the preceding gap-down day, 1.51 SPX points higher in Jan and 1.20 SPX points higher today. On the following day (tomorrow, August 14 in the analogy), the futures opened the daytime trading session 8.75 points lower but held right around the previous day’s (today in the analogue) low. It was the next day (Wednesday of this week) when the collapse began! SPX was down 2.1% on a closing basis with the futures down 2.32%. But here is why I bring up the analogue now. The VIX Index was playing with the upper B Band as that happened in Jan, perhaps implying at the time that downside stock potential was limited, just as it is happening here. In January, of course, the VIX went from around the 14 level to 50 (!) within three trading days. Is that going to happen here? Only if the analogue continues 🙂 VIX past 2 days is right around 13-14 just as in Jan! Very interesting Peter G. I also noticed that VIX hugged the upper B band for four days in June as well (22-28) so the current move certainly does not forestall additional downside. VXX also displayed sharp positive divergence at recent lows and I do not think a target of 39-40 is out of the question. I will be watching that analogy with great interest. It would align perfectly with the possible full moon low. Not sure if many of you are watching crypto. Ethereum has fallen out of bed and BTC is testing some serious lows. Luri – whats your chart say now. I find that interesting since I’m seeing Oct 12 .. Thank you for your input Dan . I’d paste it but it’s a bit long . Thanks Peter g for your input as well . In regards to puetz I’d like to finish with this . You may discover something . Not to mention lack of decent data , indicators etc…. No way I’m going to fight my own research . I have posted this time period all year . I just stick to my work . We had an inside day in the cash indices today while ES notched a lower low. I think we are going to see strong support at 2800 so I am now strongly leaning toward a final wave up later this week and possibly an unusual back to back instance of a full moon witnessing a turn at the high rather than at a low. I know this is contrary to what most folk are expecting but price trumps all. In my book this will be confirmed if we see VIX put in a new high with a strong bearish reversal candle this week. From an EW perspective, I think it would be completion of a fourth wave followed by a final fifth wave to new ATH before we get a deeper corrective fourth wave of larger degree. Looking for a new low and reversal around 2800 tomorrow. This week is an option expiry week . May get nervous and add more fuel to this bearish cycle . I’m speculating obviously yet option expiries can get crazy at times . We have a confirmed Hindenburg Omen per Robert McHugh on the NYSE. Do you know if we got HO on the Nasdaq? On the Nasdaq we had 103 new highs vs 96 new lows yesterday per the WSJ. I am not sure if the McClellan Oscillator was negative yesterday. My software package does include that indicator. My recollection is that you had mentioned on this site in the past that having the HO happen in both the NYSE and NASDAQ should get your attention. The track record of HOs has of late been spotty at best. We had a plethora of them last year and the windows all expired with not a single significant decline so I now pay less attention to them and focus on price. In an era of CB support of markets, this is not at all surprising. I agree with other who have pointed out the 2792 – 2802 area as significant. In line with that thought, I have reduced my shorts by 25% right here. Given the global picture (in terms of where the counts are in Europe and China), I am still leaning towards a break of 2790 in the next 8-10 days. But not taking some money off on the short side has been painful. So today is a turn date, I sold my puts on the AEX and bought some calls, it’s tricky with mercury retograde. But if we go higher now, I will buy back puts bigtime on Aug 21. Once again the failure to decisively take out 2800 on a strong impulse down tells me we are going higher. I am looking for a slightly lower high in VIX with a confirmed reversal tomorrow. Of course, the banksters know everyone is watching this pivot. I would not put in past them to ambush a few eager beavers with another vicious spike down before the turn. I think we get a high next full moon. Looking like the late JULY high on spx is now resistance . A failure to break above that swing high is key going forward. I’ll be rough and use calendar days . July 27 to Aug 7 was 11 calendar days . Adding 11 calendar days to Aug 7 is Aug 18 which is Saturday . That would be considered a top to top to bottom count. Yet I’m sticking to my bearish stance . Aug 19 mercury goes direct . Naked put option shorts . 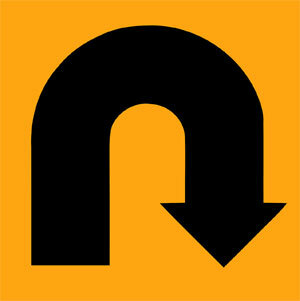 Hence and up Thursday implies a down Friday or vice versa . I have to ask myself just how much research do these people actually do ? Fractured markets are almost always a sign of trouble ahead. As of this evening we have stark divergences in the futures and cash markets of the DOW and S&P 500. Both markets in the DOW have now taken out their August 2nd lows but not so for S&P. We saw this same divergence as regards the Feb lows and here it is once more. Of course those lows have remained intact for many months now so the question is will DJI follow, or lead? I track the cash Dow much more than the spx . My thoughts are most everyone watches the Dow around the world . I tend to think it leads more than lags . It my opinion though so take it that. Below it’s Feb or April May lows I’m not so sure at the point the spx will . I’m not convinced on at this point . Both it’s Feb and March high . On both of these index’s . Like I said though I’m not convinced at this point yet it’s what I’m thinking . Yet the Feb low would hold . The Dow is a different story . It’s going to show 3 waves in it . Finding that B wave is a target . I forget if there us a June low . Anyways none of this changes my mind . Thanks for the great weekly post as usual, thought provoking as always. Have not commented for a few months as i expected some chop and to say that occurred is a mild understatement. This i think fits with Peters ES “C” wave down into August. I think if it occurs it only just pokes its feet blow the Feb lows but a new low for the year never the less IMO. The DJI is what i would watch closely because should the S&P behave as peter is illustrating i would have to think the down Challenges the 22k level, there is some serious support there so that would be the prefect spring board for a big move up for all markets. All just my humble opinion. P.S as i write this the dow futures are up over 100 points already!! You’re welcome, mdss. Thanks for the input after so long … lol. I think Peter T is expecting a “B” wave high to complete a third wave according to this week’s post, unless I mistead it. Correction. Peter T actually said we need to complete a third OR b wave, which makes more sense of course. My mistake. This is another sign of the topping process . Be the world’s tallest but it would be the tallest in ausralia . Yet ….. It’s a hedge for me. Looking like the market opens near the bottom of the gap . This ramp is as phony as a three dollar bill. You are looking at a classic bear market rally based on nothing but hopium. I will be looking at VIX to trigger a short of this cash dump. Glad I took profits yesterday. Good call by John and Verne on the date and level for ES turn/support. Around 2840-2845 on ES is still a sale over the next couple of days in expectation of a decline into end of the month – basically 1 is done and selling the top of 2 for a move lower in wave 3. John has a more precise date around 21st. He has been on the money – so let’s see if this one plays out. I do not understand turn dates well – so I will stick to Elliot rules and sell ES in my target zone to go back to my full short position. You’ve got nerves of steel Vivek. No matter how convinced I was of the main trend, I doubt I could withstand a 400 point counter-trend ramp as we are seeing today…and I don’t easily get rattled. I suspect we could be seeing a bit of a short squeeze. While I am not quite ready to short the indices, I am more than ready to start scaling back into long vol positions. I still have some UVXY calls expiring next Friday and today I start loading up on VIX 12 strikes calls with September expiration. I think the next significant event will be in the volatility sphere. Yesterday’s decline did not even come close to resolving the steep positive divergences seen at recent lows. I think anybody chasing this relief rally is gonna get body slammed. Ok Verne – I bought some VIX calls as well. Have not tried it before. Lets see how it goes. It may take a day or two but I think we see a gap higher eventually. I also sold calls today after yesterday’s shadow in anticipation of this relief rally. I suspect the coming full moon will exhert some influence. We shall see…! Lol! I am not the only one! VIX ALREADY on the move. This is going to be REAL interesting…! So the turn came on the 15th, do not know how high we will go, but I will go full short on Aug 20/21. till……… the full moon howllllll or Aug 29. Like taking candy from a baby..buying EVERY dip. Bears have zero follow through. Hit a double on my calls today exit at 2850. Waiting on 2875-80 on spx or break below peters 2790. I’ll buy all dips in between. Yep. Scalping both the dips and rips is the way to go. Cash Dow and spx came back to their late JULY highs . It is starting to look like we are in some sort of triangle with a possible D wave completion yesterday. If this is correct it raises some interesting scenarios. Triangle E wave reversals tend to be sharp and present one of the most explosive trading oportunities. They are also commpn in fourth wave positions, heralding the imminent end of a trend. The huge question is how high the thrust will go, and how long will it last? It could conceivably end in a day or two. The difference is of course whether we see a high or low around the 26. A protracted move out of the triangle argues for a high. A brief move means we could see a waterfall decline next week to co-incide with a 26 low. Either way, we have some great trade set-ups just ahead. Hope everyone has a great weekend. :). But still buying shorter term SPX calls on dips… Until 2790 broken. While US Indices have held close to the highs, rest of the world is in a lot more pain. Most of Asia and parts of Europe are already trading down significantly – Those markets had the reaction from Solar and lunar eclipses close to each other starting from the last full moon. Japan is at a critical juncture and can break sharply lower in the coming weeks. Interesting fact : September full moon and Federal reserve meeting are right next to each other. I would expect an important turn 3rd week of September. Yes I’m expecting new highs for SPX @ 2875-80. Looking good so far! Only about 22 points away. Yee haw. Giddy up..the bulls is off and running! Thank you Mr Market, another dip…another double on SPY calls. In at 0.55 on dip and sold at 1.10 on recovery. Wash rinse repeat! Adding to my long vol, lol! Bulls make money, bears make money. Pigs get slaughtered !! So true.. why I like scalping. Take the easy double and move on. Could’ve made a triple today but stuck to my rules. Nicely done Charles! Spoken like a true trader! Indeed! B-D trend-line looks absolutely perfect. We should get a brief move down for E on Monday than off to the races next week for what will very likely be a full moon high. Have a great week-end all. Charles, which strike price and expiration date did you set for this trade? Definitely a question from a nube.